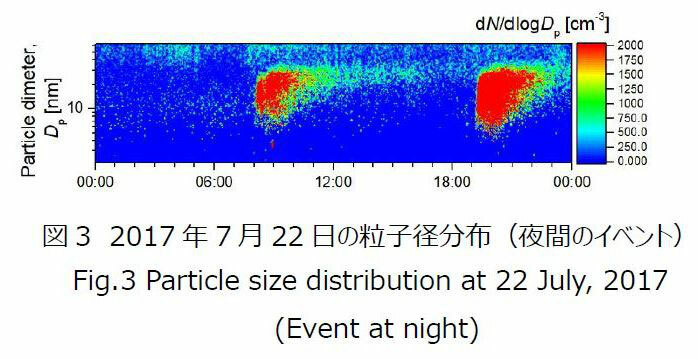 In the present work, continuous measurement of the particle size distribution of atmospheric aerosol with the size range of 2~64 nm was carried out using Nano-SMPS at the summit of Mt. Fuji from 15 July to 23 August. Figure 1 shows the results of particle size distribution during the summer observation of this year. The horizontal axis and the vertical axis represents the date and the particle diameter (Dp), respectively. Then, dN/dlogDp is indicated by counter plots. Although it is somewhat hard to pick up due to the small horizontal scale, red lines are observed in some places. The phenomena that the particle concentration is increasing at this time can be confirmed. A phenomenon which seems to be a new particle formation event is shown in Fig. 2. An event at night is also observed as shown in Fig.3. 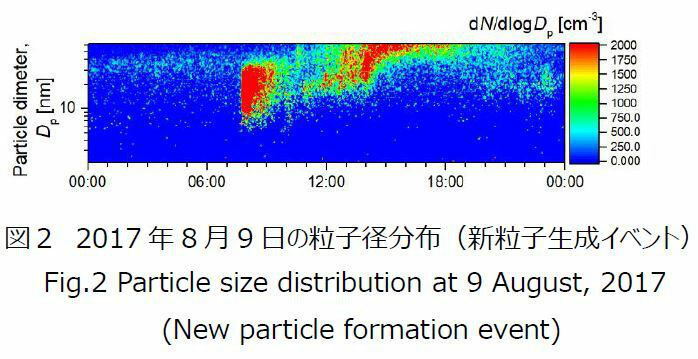 We would like to analyze the particle formation events by comparing it with the data on the particle size distribution of the larger particle, the weather conditions and various gas concentrations in our future work.